Instagram is rumored to be beta testing an account switching feature that would allow users to enter in another set of login credentials to their current account. A new selector feature allows you to switch between multiple accounts, and a banner notification makes it clear when you’ve switched accounts. The initial test appeared on the Android version of the social network, and it’s unclear when and how this feature will be rolled out. What this means for you: Sick of logging in and out of your personal Instagram account when you need to post on your business account? When the update is live for all users, you’ll be able to switch between accounts easily. This update would also presumably allow you to see notifications across both accounts, making it more efficient to check in on notifications from your followers. Being active on your business Instagram will be much easier for those who are also active on their personal accounts! Pinterest has updated its mobile experience to highlight more recent pins and make your content easier to find. Previously, user’s profile pages were organized by board with the first pin ever added serving as a “billboard” for the collection – making it hard to find recently pinned content and impossible to search. The new profile design highlights the user’s six more recent pins, and it also added the ability to sort pins alphabetically or by topic. With this update, users can easily find their products and projects for later use. What this means for you: This update encourages users to revisit their pinned content, thereby extending the life of your business’ pins. Once a bride or groom pins your content, they can easily find it again to click through. It also serves as a better reminder when users log on, since seeing that dream wedding dress or beautiful bouquet again jogs the user’s memory so they can continue their research or reach out to your business. Plus, with the ability to sort pins alphabetically or by topic, users can find your content again if they haven’t thought about it recently. As part of the Facebook Mentions app for public figures, celebrities, and other influencers, Facebook has introduced Live, a new way for public figures to share videos with their fans on Facebook. The new feature allows for a more direct connection between the influencer and their fans, but it also takes advantage of new live-streaming technologies being rolled out like Periscope and Meerkat. For advertisers who want their Twitter campaigns to go beyond the social network, Twitter has expanded its platform to run advertisements on other publisher sites and apps. Additionally, Twitter added new ad objectives and ad formats to help advertisers accomplish a variety of goals across the Twitter Audience Platform. Users will be able to retweet or favorite ads directly from the ad unit. For those frustrated by Instagram’s square photo requirement, the social network has released an update that drops the requirement and allows for both landscape and portrait photos and videos. Instagram made this change based on user feedback that for some photos, square formatting is not a good option. Now users can post their photos and videos in the formats they were originally intended, or crop to be square. In late June, Facebook announced that it has made yet another News Feed tweak – this time to take more video engagement into account. Previously, Facebook tracked whether you watch a video and for how long. This new update takes into account even more video actions, such as turning on sound or playing the video in full screen. These actions taken on videos affect the prioritization of videos in your News Feed, so the more you interact with videos, the more videos you’ll see. Though the social network has been building towards more integrated e-commerce for a while, Pinterest has finally unveiled a new type of Rich Pin that allows users to purchase things directly from Pinterest partner retailers like Macy’s or Nordstrom. Pinterest users will be able to see prices, select details about the product (like color), and purchase with one tap of a button with a credit card or though Apple Pay. Buyable Pins will also show up in Pinterest recommendations and search. Twitter has taken a page out of Pinterest’s book with new Product Pages and Collections. These new features include multiple tweets from a brand, but they also have basic product information and the ability to actually purchase those products. Collections look like normal tweets with multiple images, but when a user opens it they get more information and more images which all link to actual product pages. Twitter plans to extend this initial test to provide more personalized and relevant information to users. Facebook’s standalone app for messaging, Messenger, has introduced the ability for users to tie their debit cards to their Facebook accounts in order to send money to peers through messaging. Money sent through Messenger is transferred to Facebook before the network sends it along to the user’s bank. Peer-to-peer payment apps like Venmo and Square already exist, but this new functionality is novel as many users are already using Messenger to have conversations that culminate in payments which they could not do through the network. Facebook has combined both the organization and payment for events, trips and other peer-to-peer payments. Twitter recently announced its partnership with Foursquare to allow users to include their location in tweets. Users can include location in tweets now, but the new Foursquare partnership would allow users to be more specific in their locations. Foursquare exists now to allow users to recommend restaurants and other venues based on preferences and location, and Twitter is eager to access that data and leverage it on its own network. Twitter’s goal is to use Foursquare information to be proactive with recommendations and location data, which is a big move for both companies. In addition to Facebook’s existing ad products, the social network has announced new Product Ads, designed to help businesses promote products or product catalogs across all devices. These ads allow businesses to highlight their products to specific audiences, or let Facebook display the most relevant products to people. These are a great way to link directly to your products and offer discounts. Twitter’s latest tool, Curator, helps media outlets and businesses figure out which topics are popular and where. Curator allows you to search through tweets, Vine videos and other data with filters to narrow down the results by location, word count, sentiment and more. Users can also select tweets from the search results to present them together in relevant groups. Stingray, a spam-fighting service widely used at Pinterest, can identify inappropriate and unwanted behavior on the social network in real-time. Since many social networks rely on manual moderation to keep spam posts under control, Stingray balances automatic detection and manual intervention. Rather than block the spam account, the service makes it so that the spammer’s posts are invisible to others. The big social networks are still finding new ways to innovate and introduce new features, even though they’re years old at this point. Don’t be fooled – just because networks like Facebook, Twitter or Pinterest aren’t shiny and new doesn’t mean that their updates don’t constantly influence the way businesses conduct online marketing. 2014 was still a huge year for the big social players! If you’re just now deciding whether or not to start a new social media marketing strategy, make sure you catch up on the latest social media news and updates before you start planning for the New Year. Before you spend time searching the news stories to find out what’s next in social media, check out the biggest updates to social networks in 2014! Facebook’s biggest update for businesses was announced in December – new tools and insights for businesses are coming for 2015! The exciting announcement came as a result of feedback from publishers who need more social media marketing tools than just paid options. Facebook is introducing interest targeting for organic posts that allows you to target a subset of people who like your page so only that subset sees your post. Facebook will also give publishers the option to add a Post End Date to prevent users from seeing out-of-date posts from your business. Finally, Facebook will introduce Smart Publishing to help businesses publish the most relevant and timely posts automatically. Besides the Facebook redesign in March and the News Feed algorithm update in June, these new tools are the biggest Facebook news for businesses in 2014! 2014 was a big year for Twitter. Following its late-year IPO in 2013, Twitter created a new desktop design that radically changed the layout of the social network. The network then added Promoted Accounts to Twitter search so businesses could suggest their account to users searching on a similar topic. In July, Twitter helped businesses out in a big way by expanding Twitter Analytics so businesses could find out more about those following them as well as other users who show interest in their brand or activities. In the final months of the year Twitter also made strides in the e-commerce market by adding the “Buy” button to tweets as well as adding Offers to help businesses drive urgency with deals. All these features helped Twitter to solidify its presence in the top of the social media world, and businesses would do well to take advantage of these features in the New Year. While Facebook’s name policy is not new, the social network has made headlines this month as it began enforcing the policy. Facebook’s policy maintains that it requires “everyone to provide their real names, so you always know who you’re connecting with.” This policy affects personal, individual Facebook profiles, not business pages – but if you have yet to create a real business page for your business, now’s the time to make the switch! Twitter took its first steps towards fully integrated e-commerce this month with the “Buy” button. While the process is still early and the button is only available for test partners, this new feature allows retailers to monetize their Twitter followers by allowing them to buy while on Twitter. This is especially easy for mobile users to purchase through their smartphone with fewer steps. Great news for Pros looking to advertise on Pinterest: the network is releasing new advertising products that will help grow your Pinterest following and help you track conversions! Promoted Pins have been an advertising product for a while, but Pinterest is getting serious with its tracking abilities to help you determine ROI and give you insight into your audience. In today’s marketing landscape, 72% of internet users are active on social media and 46% of online users count on social media when making a purchase decision. Those are impressive statistics! Is your wedding business taking advantage of these statistics to reach couples planning their wedding? If you need help building a buzzworthy brand in the wedding industry, our infographic has tips for using social media to grow your business’ presence! For those who use the Facebook app on iOS, you may have noticed a new option in the drop down menu you see in the right corner of link posts. 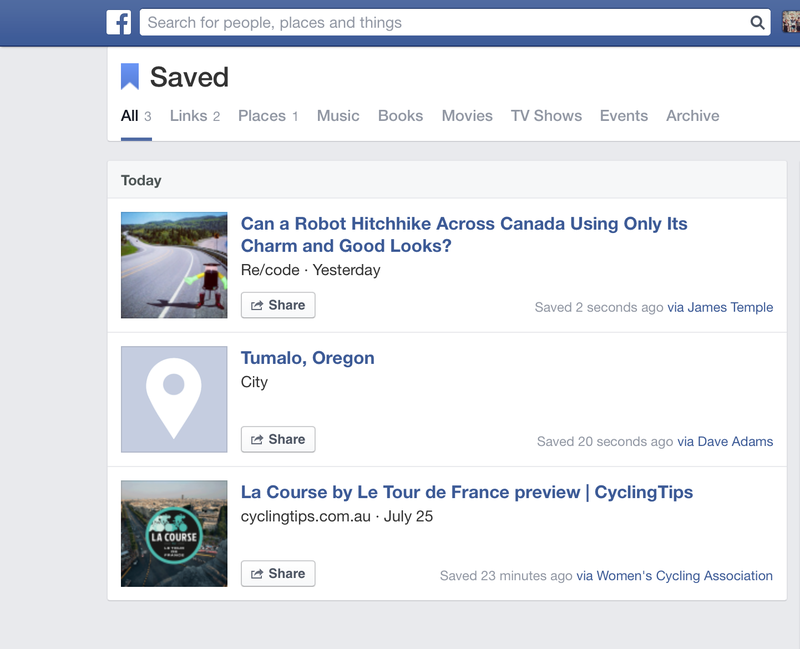 Facebook is following the lead of services like Pocket and allowing users to “save” links to a list to be found later. This feature makes it easier for users to find stories they may not have had time to look through at the time they first saw it in their News Feed. This feature extends the life of links you post on your page, as your audience can save them for a more convenient time! Twitter has been testing the value of different on actions on Twitter and how they show up in your Twitter timeline. Previously, when a user “Favorited” another tweet, a notification was sent to the other user, but it did not create a story within other people’s timelines. Now, Twitter is testing including Favorites within the timeline, similar to a Retweet. Similar to this test is including tweets from accounts that are followed by one or more of your followers. Facebook has updated its News Feed algorithm yet again! This change, though, should make users a bit happier: the change will assist Facebook in serving users videos that are most relevant to them. Now, a video’s “weight” or value in the News Feed will be partially determined by how long a user watches a video and the number of engagement metrics such as likes, comments and shares. If you typically watch a lot of videos when browsing your News Feed, you’ll start seeing more of them with this new change! The good news for businesses is that the videos that are popular and being watched will reach a larger audience than those that have low engagement. After years with no upgraded photo filters, Instagram releases its biggest update so far! Rather than adding new photo filters, the photo-sharing app has improved its editing options for existing filters. Users can select a filter and use a slider to determine how much of the filter’s effect they’d like to apply. Then, users can also choose from eight new photo adjustment tools that many editing programs offer, such as brightness, contracts, saturation, highlights and more. Businesses can use these new tools to really have more control over images posted on Instagram, which makes it easier to keep a brand identity flowing through on your social networks!